Welcome to St Albans Trapeze and Aerial Arts. We offer classes for adults and children in static trapeze, aerial silks, aerial yoga and more in a friendly and welcoming environment. Thanks to all of you who have booked onto the new half term classes - the last day of re-booking is Friday 5th April, so make sure you have secured your place! We currently have no spaces in our children's and teenagers' classes. Due to a waiting list for both of these, we are not holding any more children's/teenager taster classes in the near future. If your child is interested in aerial circus skills, please get in contact so we can put you on the waiting list. The 6pm Friday Mixed Ability Class is only for ages 16+. There are roadworks planned on the Dark Lane access to the Grove Junior School, Harpenden from Saturday 6th April to Tuesday 16th April - If you are driving in for Saturday, Sunday or Monday sessions you can park in the car park at the bottom of Dark Lane (on your immediate right once you have turned into Dark Lane) and walk up. Please leave yourselves an extra few minutes to get to class. Static trapeze is our bread and butter - it's what we start our beginners on and it's our most popular piece of equipment. Not to be confused with flying trapeze, static trapeze is all about making strong, beautiful shapes while you move your body around the trapeze. We also teach basic doubles trapeze on request. With billowing ribbons of fabric and seemingly death-defying drops, aerial silks performances look glamorous and daring - but be warned, these stretchy pieces of fabric can be tricky to conquer at first! However, the feeling of defying gravity is definitely worth it. 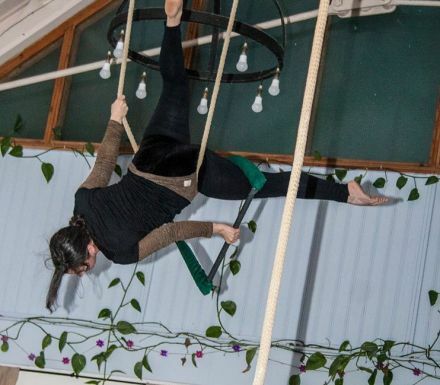 Increasingly popular in recent years, the aerial hoop (or lyra as it is sometimes known) offers huge potential for a variety of different tricks, poses and spins. Also known by its fancy French name, corde lisse, aerial rope is exactly as it sounds. While we always teach basic rope climbing as part of our classes, the art of aerial rope offers so much more and will do wonders for your fitness. 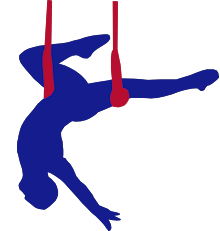 Two straps with loops for the hands attached to a pivot, aerial straps require extreme strength and precision in order to successfully execute tricks and moves. Not a piece of equipment for those new to aerial! Taught on request by straps artiste Leanne Laird. A fusion of aerial arts and traditional yoga, aerial yoga offers a mindful and relaxing way of increasing flexibility, mobility and strength, as well as improving posture. Classes for beginners and intermediates. No commitment needed for these classes as long as you've booked on at least 24 hours before hand. Classes for teenagers beginners focusing on static trapeze, aerial silks, as well as some aerial hammock. 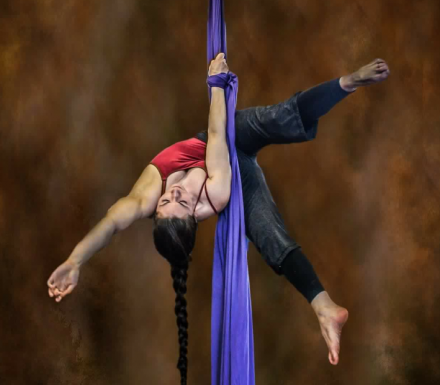 Classes for improvers/intermediates focusing on static trapeze and aerial silks. Pre-requisites: must have a basic knowledge of static trapeze moves; be able to perform French and Russian climbs; and be able to invert ('straddle up') and hold for at least 5 seconds. Get to grips with aerial silks and static trapeze and seriously improve your upper body and core strength in these aerial classes for adults. Fun children's circus skills workshop for those aged 7-11, focusing on static trapeze, aerial hammock and aerial silks. An open session for people with some experience to work on routines in a relaxed informal environment. Kate became hooked on trapeze at London's Circus Space (now the National Centre for Circus Arts) when she joined their adult programme in 1998 - there she discovered the joy of hanging upside down by unexpected parts of the body on a variety of pieces of equipment, including static trapeze, corde lisse and silks. She continued training there just for the fun of it until having children seven years later. She came to St Albans to retrain in 2012 before taking over the treasury role of the business in 2013. Kate is also our artistic director - as a former lighting technician, she plays a key part in organising and directing our showcases and performances. She is DBS checked and has first aid training. A professional aerialist and performer for over seven years now, Leanne Laird first started training in aerial arts at Circomedia, where she specialised in aerial acrobatics. She has since performed in venues including London's infamous Club Antichrist and for a variety of agencies. Leanne has a comprehensive knowledge of anatomy and its application to aerial activities and injury prevention. While Leanne devotes most of her energy to straps (a physically demanding discipline not to be undertaken without prior aerial experience), she has a diverse knowledge of all the main aerial apparatus including static trapeze, aerial hoop, corde lisse and silks. She is available for intermediate and advanced teaching and private lessons on request. You can view her previous aerial acts here. Ali has been teaching aerial skills for over four years now. She studied and trained aerial arts for three months full time at the Essential Aerial Professionals course at My Aerial Home in London in 2017 where she specialised in solo static trapeze. Now retired from competing, Ali and Pete won the semi-finals in the UK Aerial Performance Championships 2016 and performed in the finals of this competition in 2017 with their doubles trapeze routine. Ali won the semi-finals in 2017 in the instructor category on solo dance trapeze. In 2018, she was invited to join the cast of 1920s-themed show Party Like Gatsby. She can be found on social media as @alidoesaerial. Despite not discovering aerial until his early 40s, Pete, 54, is now an enthusiastic proponent of the benefits of aerial skills for everyone. He has been practising at St Albans for over 10 years now, and most enjoys doubles trapeze, silks and partner acrobalance. Pete was awarded first place in the amateur category for trapeze at the UK Aerial Nationals 2015, and along with doubles trapeze partner Ali, achieved first place in their heat of the semi-finals in the UK Aerial Performance Championships 2016. He also performed in the finals of this competition in 2017. Pete has completed a Silks Teacher Training qualification from Xpert Fitness and holds a CircusFit qualification. Our children's teacher Sarah is usually found hanging upside down, studying for her degree in psychology, or eating pizza (though not all at the same time). 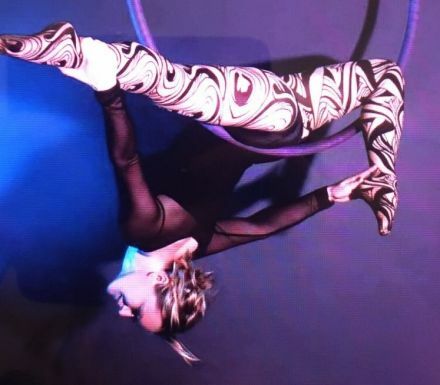 She was first taught the joy of aerial circus skills by Rachel Walker (Ali's older sister) when she was 10 years old, after which she auditioned and succeeded in gaining a place in the National Youth Circus Group at London's National Centre for Circus Arts. As a result, Sarah has a wealth of knowledge, empathy and experience to share with the children who attend our classes. Sarah specialises in aerial silks and improvisational static trapeze, and loves nothing more than devising new shapes, moves and transitions on aerial equipment. She's also adept at doubles trapeze, rope climbing and static cloud swing. She teaches in our Sunday children's circus skills class and also helps out with our children's circus parties. A qualified dance teacher who has an array of experience including tap, modern, ballroom and ballet, Tacha loves adapting her dancing and choreography skills to the world of aerial, which she first delved into more than 10 years ago. Also a trained personal trainer, Tacha balances her youth work, dance classes and aerial lessons with being a mother of one in her hometown of Southdown, Harpenden. She can be found teaching our children's Sunday aerial sessions, where she encourages our 7-11 year olds to explore creative movement and expression both on the ground and in the air. Office worker by day and aerial silks superstar by night, Natalie has been practising aerial silks for five years now. 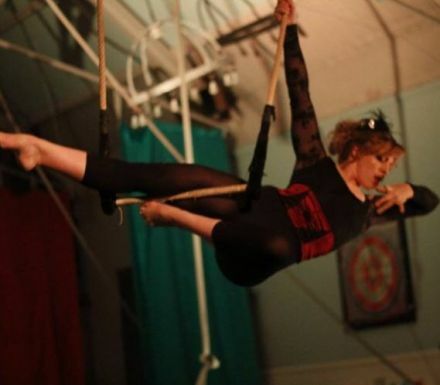 She mainly works on aerial silks, but is also competent on static trapeze and aerial hoop. As well as training on Friday evening, Natalie can also be found teaching the teenagers in our 4.30pm intermediate class, and occasionally helping out with the Sunday children's aerial class. When she's not upside down, Natalie enjoys live music with her friends, having fabulous hair, and the companionship of her feline friends.